Spread zucchini and onions onto rimmed baking sheet; drizzle with oil. Bake 15 min. Meanwhile, mix dressing and pesto in small bowl until blended. Add chicken, 1 breast at a time; turn to evenly coat both sides of breast. Remove baking sheet from oven. 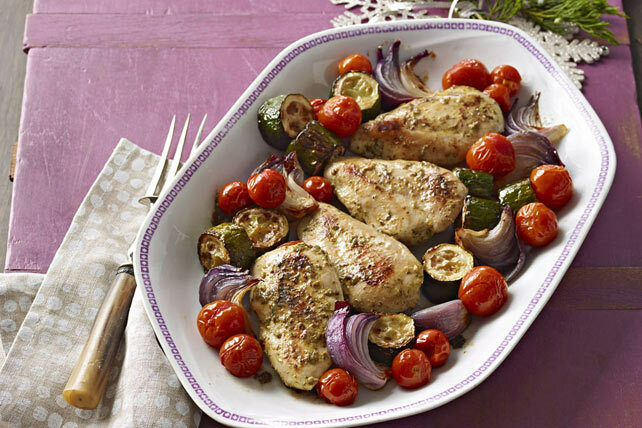 Turn vegetables; add chicken to baking sheet. Bake 20 min. or chicken is done (170ºF), adding tomatoes for the last 5 min. Prepare using your favourite fresh vegetables, such as peppers, asparagus and/or mushrooms. For easy cleanup, cover baking sheet with foil before using as directed. The zucchini and tomatoes in this delicious dish team up to provide a good source of vitamin C, per serving.